Kenzie lived her first four years as a workin' girl. 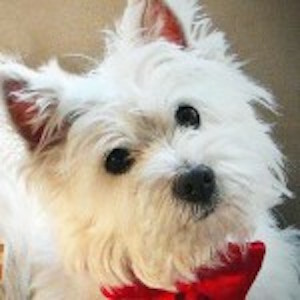 When the puppy mill was done with her makin' babies, they auctioned her off and she was gratefully taken in by Westie Rescue of Missouri. In 2010, Kenzie came to Minnesota and her new home. Since she lived her life to date in a cage, she was not potty trained, had never walked on a leash, and was afraid of everything and everybody. Fast forward a year and Kenzie was a new dog. She went for car rides, to training, daycare, on road trips, shopping - you name it and she went there and met lots and lots of people. Kenzie will stop in front of everyone she meets waiting for them to pet her. Her favorite visiting spots are at the library with kids reading to her and to events where she can meet alot of people. When Kenzie is not visiting, her favorite things are to terrier-ize her sister, Caleigh, and to play with her toys.